We've reached the point where Lucas is coming home with handfuls of Christmas cards in his book bag on a daily basis and the postman is cheerfully posting more through the letter box, too. 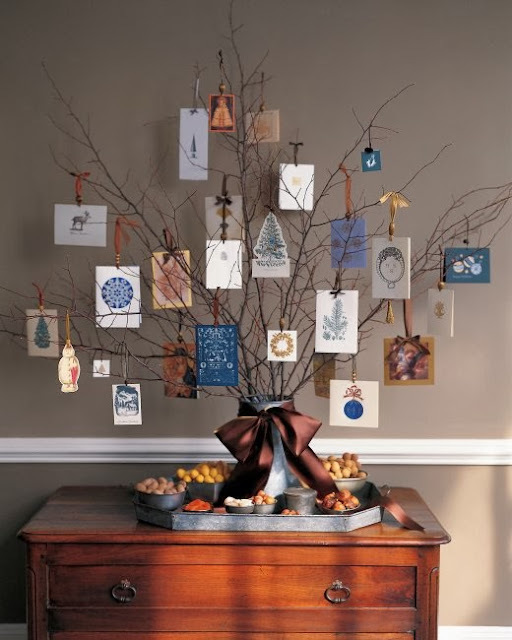 There's only so much space on the mantelpiece, so it's time to think about how to display those cards! 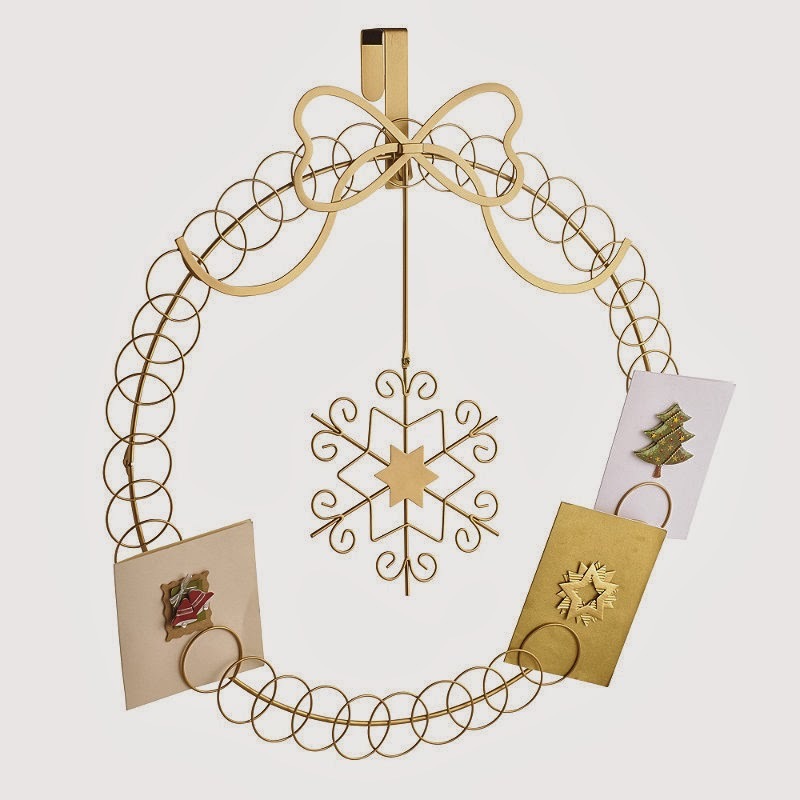 I'm not a fan of Martha, but I do love her Christmas Card Tree (above). It's very easy to make and it looks fantastic if you've only got a few cards to display. 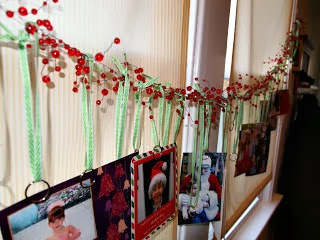 If you grew up with cards hooked over a length of twine (or yarn) pinned to the wall, then this pretty garland is a nice upgrade on that idea. It would look stunning against a white wall! 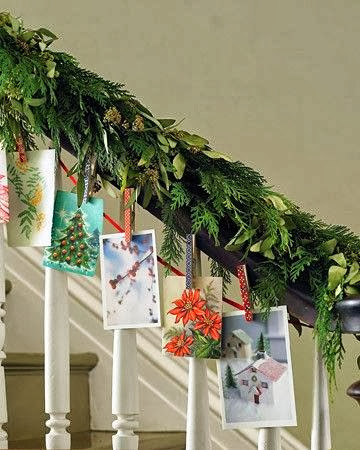 You could also use clothes pins to clip cards onto a length of tinsel that's been pinned to the wall! I love this garland, ribbon and clothes pin combination on the bannister in what surely must be a gorgeous home! If we had a bannister like this--ours is just a solid sheet of wood--I would totally wind greenery around it and pretend that I lived in a stately home! If the thought of doing anything remotely crafty in December makes you laugh slightly hysterically, then you can buy some beautiful card holders! I really like this over the door one from Lakeland. 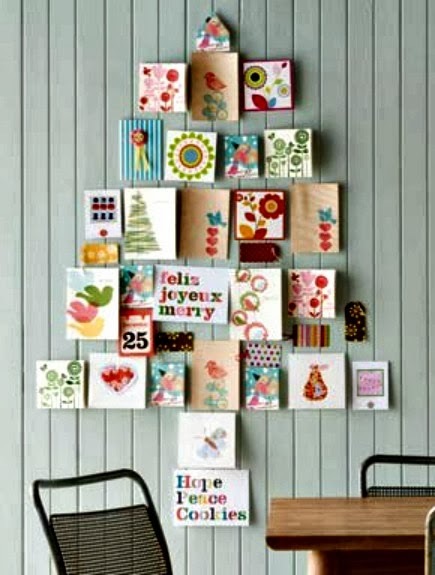 As for me, I'm going to arrange our cards into a Christmas tree shape on the kitchen door! I think I'll have to make a little star for the top...I don't think I've ever had a triangular-shaped card in the post before! Such nice ideas. Almost certain that I'll be sticking them to the wall in the shape of something festive! Maybe Santa will bring me some more time this year so I can do something more creative...not bloody likely. More time would be the greatest gift of all! Still, I did multi-task and wrote the rest of my Christmas cards this morning while waiting for the car to be MOTd!